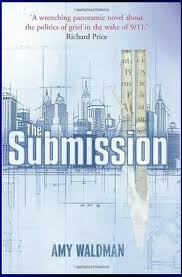 The first book I read this year was The Submission: A Novel. It's very interesting and smart. A Muslim is chosen anonymously to design the 9/11 memorial. When people find out that he's a Muslim, they go nuts. I LOVE the ending so if you finish it and want to talk about it, I'm here for you. This book is fiction but you know it's sort of like what really happened with the memorial, right? Oh I just love interestingness. The Submission is one of the best books I've read all year. It sure feels good to call this a "Book Report." It's a short post about a book I liked which I read entirely and didn't skim. The "Book Reports" I gave in high school were a little bit the opposite of what I just said. I'm glad to know you liked this. I ordered it on my kindle and was looking forward to it. Now I might have to move it up a spot or two. Thanks for the book report. You should get extra credit for doing an actual report. Because of you I read this book and I loved it. Although it was depressing. But sort of good depressing. Although I want to know why you liked the ending - I was really really mad that (SPOILERS) Claire wasn't redeemed.